I had a little bit of gravel-road therapy this weekend, found myself cruising rural Burleigh County and made a pit stop at Lake Mitchell. I contemplated dipping my toes in the water but like a good central Dakotan I just walked along the lake’s edge and around the nearby picnic shelters. A year ago I probably would have just appreciated the monument for its folk-art quality. I was at a cemetery earlier that day and the various sections were marked in a similar manner. I dug around a bit and found out that the same person was responsible for those sites.Unfortunately I couldn’t find out much else. The area’s folk history reflects the people of the area and their shared values. It warmed my heart to see that whoever created this piece valued freedom of the press and free speech so much that they preserved them in iron. Especially in a world where the media is treated like a create-your-own adventure series. 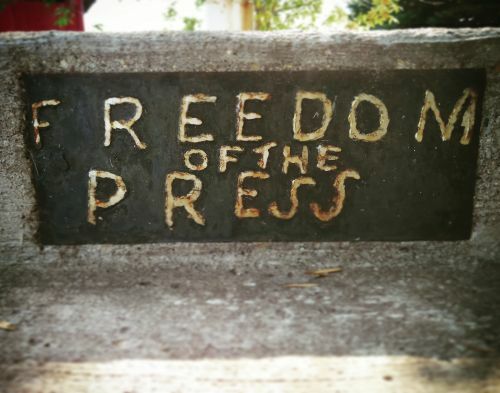 The one plaque that surprised and resonated within me was the plaque that read “freedom of the press.” The fact that the fabricator appreciated that freedom so much that it was written in iron and outlasted its creator, really struck a chord. I had a conversation with a veteran of Operation Desert Storm in rural Barnes county the other day. Once I told him I worked in the newspaper business, he immediately disclosed his distrust and dislike of the media, but his bias came from his experience overseas. Along with his mission and trying to protect himself, it was his responsibility to protect war correspondents whenever they did a ride-along. He felt he risked his life for them but didn’t feel like they accurately depicted the horrors of war -- that the story of the soldier was lost despite the sacrifices they made. I told him I couldn’t speak on behalf of these large media outlets. I work for a small operation and our intent is to reflect the voice of the people and inform and educate the public, but the more we talked the more I realized that that IS the mission of the media, no matter how big or how small. By the end of our conversation he smiled and patted me on the back and said that he would gladly have protected me; and that spoke volumes. On an unrelated note, we also made a pact to keep smiling because it’s disarming. Our words are powerful. They have the power to build, shape and destroy opinions and perspectives. 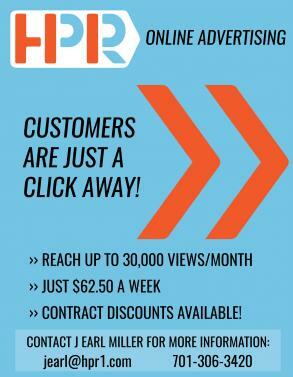 When I first started at the HPR, now close to three years ago, the best advice came from John Strand. Sometimes I affectionately refer to John as the Atticus Finch of Fargo. He has a gentle way of putting things into perspective. He told me that our ink must never be used maliciously. We report the truth and always have our “news hats” on hand. The freedom of the press is protected under the First Amendment to the Constitution, as well as freedom of speech and freedom of worship. Can you imagine if the whole country took our first amendment rights as seriously as NRA members take their second amendment rights? Our job as the press is to serve as a watchdog and to call out injustices when we see them. It is the people’s right to know. Why else would the current administration find media presence so threatening and try to discredit us? We deserve to know the truth, in fact we don’t just deserve it. It is our right as Americans.